A court in Egypt has sentenced a blogger to three years in prison for blasphemy and contempt of religion. Alber Saber was arrested in September after neighbours accused him of posting links to a film mocking Islam that led to protests across the Muslim world. 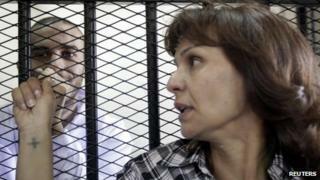 Mr Saber, an atheist from a Coptic Christian family, can appeal against the ruling if he pays $167 (£100) bail. The case raises concerns over freedom of expression just as Egyptians are set to vote on a draft constitution. Liberals, secularists and the Coptic Church have complained that the document fails to protect basic rights, and that the constituent assembly which approved the charter last month was dominated by Islamists. Mr Saber was initially accused of circulating links to a 14-minute trailer for the film, Innocence of Muslims, which denigrates the Prophet Muhammad. But he denied promoting the video and later faced charges relating to other statements critical of Islam and Christianity which police investigators allegedly found online and on his computer at his home. Human rights groups have called for Mr Saber's release. There has been a proliferation of prosecutions for blasphemy in Egypt in the nearly two years since Hosni Mubarak was overthrown. Many of those targeted are Copts, who make up about 10% of the population. Although blasphemy has long been a criminal offence, Article 44 of the draft constitution contains a specific article prohibiting insulting prophets. Human rights activists have warned that it is inherently contradictory to Articles 43 and 45, which guarantee freedom of belief and freedom of thought and opinion. "Expect to see many more blasphemy prosecutions in the future now that it's embedded as a crime in the constitution," Heba Morayef, a researcher with Human Rights Watch, told the New York Times.